October 22 – January 15, 2017 at Namgyal Choling Gompa and Crystal Mountain Society, Galiano Island, B.C. Canada. 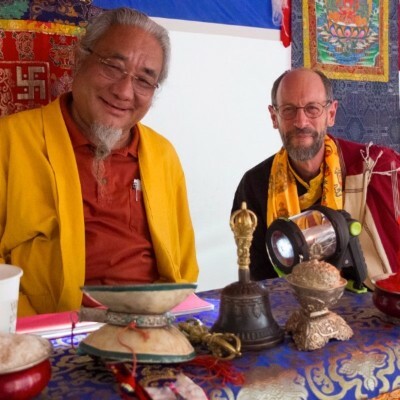 It is with great joy that Crystal Mountain Society and Lama Mark Webber are very pleased to announce a three-month meditation retreat to be opened by Lho Ontul Rinpoche. It is a rare privilege to host such a great spiritual master. His clarity, compassion and display of Dharma, along with humour, is a precious jewel. Ontul Rinpoche will be travelling with his son, Karma Ratna Rinpoche, the emanation of a great Terton. Ontul Rinpoche will be in residence at Namgyal Choling Gompa for three weeks and possibly as long as the entire retreat. He has accepted the request to once again give Dharma classes, bestow Empowerments and reading transmissions. The main focus of this retreat will be on the Drikung Yangzab Dzogchen cycle of practices. In addition a series of Drikung Kagyu empowerments have also been requested. Lama Mark Webber will also be in residence for this retreat and will serve in a supportive role for his Lama, but available for guidance or teachings for the duration of the retreat. We are very pleased that Lho Ratna Rinpoche will also be joining us once again as his father’s translator and to give his wise guidance for us all. Registration fees are requested for expenses incurred in making the teaching available. In keeping with Buddhist tradition no fees will be charged for the actual Teachings. Dana for the teacher is always gratefully accepted. Ontul Rinpoche holds both the unbroken lineages of the Mahamudra and Maha Ati transmission of Drigung Kagyu and Nyingma. 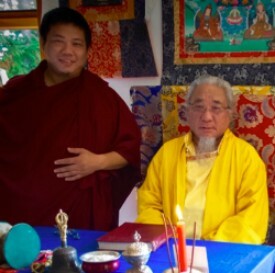 Rinpoche is a well known Dzogchen Master who has the blessings from H.H. 16th Gyalwa Karmapa and His Holiness Drigung Kyabgon Chetsang Rinpoche. For a more detailed biography, and further information about Ontul Rinpoche, please visit his website (http://www.dk- petsek.org/ontul.html).